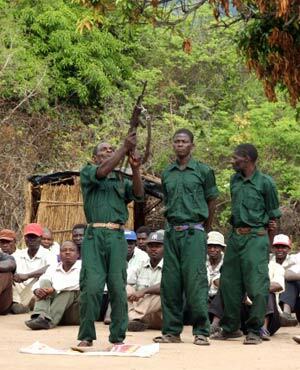 Maputo (AIM) â€“ The Mozambican police have announced the arrest on Monday of four Renamo members who were illicitly sworn in as â€œregulosâ€ (traditional chiefs) in the northern province of Nampula. According to the spokesperson for the Nampula provincial police command, Sergio Mourinho, interviewed by the independent television station STV, the four were sworn in and presented publicly as chiefs by the local Renamo political delegate in the small town of Iapala in Ribaue district. The Renamo delegate was also arrested. This was part of Renamoâ€™s drive to seize power in six northern provinces, including Nampula, and Mourinho warned that similar ceremonies anywhere else in the province would not be tolerated. He accused the Renamo delegate of â€œincitement to violence and disturbance of public orderâ€. â€œIn this country, there is only one government, which emerged from the elections of October 2014â€, he said. â€œWe donâ€™t have parallel governments and the police will not tolerate this sort of act. All those who attack state security will be detainedâ€. Mourinho said that so far the Iapala case was an isolated incident â€“ but the police had information that throughout the province ceremonies are being prepared â€œto set up a government that doesnâ€™t existâ€. â€œThey say they are presenting their regulos, and later they will appoint heads of administrative posts, district administrators and provincial governorsâ€, he added. â€œThis is an attack against public order and against the Constitutionâ€. The independent newssheet â€œMediafaxâ€ named the would-be regulos as A. Mulukh, A. Khurela, A. Â Avukulu and T. Anacleto. The interim Renamo provincial delegate Abiba Aba confirmed the arrests, but said she did not know why these Renamo members had been detained. She added that Renamo is contacting the authorities for an explanation of the arrests. Renamo leader Afonso Dhlakama has repeatedly threatened that Renamo will seize six provinces (Manica, Sofala, Tete, Zambezia, Nampula and Niassa) as from March.